A Celebration of Teresa Schwartz, Retiring Executive Director! 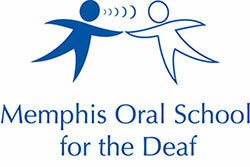 On Friday, May 18, 2018, our community came together to celebrate MOSD Retiring Executive Director, Teresa Schwartz and the many years of service she has poured into Memphis Oral School for the Deaf. The reception began as the new MOSD Executive Director, Lauren Hays, welcomed everyone and acknowledged the special guests in attendance. Shelby County Commissioner Mark Billingsley spoke about the impact Teresa has made in the Memphis area and presented her with a resolution he personally sponsored to honor her 45 years of service. A Germantown Alderman, Rocky Janda, then proclaimed on behalf of Mayor Mike Palazzolo that Friday, May 18, 2018 is now "Teresa Schwartz Day." Teresa was gifted two butterfly bushes from the MOSD staff and the students made her a beautiful butterfly hand-printed garden flag. Letters and cards came in from former students, families and co-workers who have all benefited from knowing Teresa and were stored in a commemorative box that was presented to Teresa. As Teresa retires, she leaves a legacy of hope and dedication to the families of children with hearing loss all across the Mid South. Thank you, Ms. Teresa, you will be missed!